Keep track of your nutrition and fitness with the LIVESTRONG.COM MyPlate Calorie Tracker for iPhone and iPad, and reach your health goals in no time! This handy guide will walk you through how, with a simple tap, you can track how many calories you consume, burn and net on a daily basis. 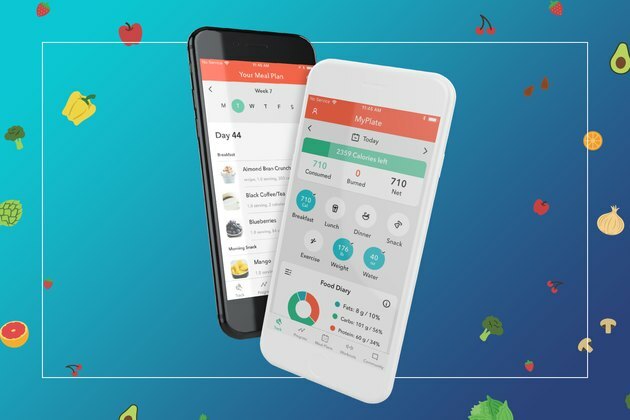 Keeping track of your progress for everything from your weight and daily calories to your protein, fat and carbohydrate macros has never been easier! Participate on the LIVESTRONG.COM community message boards in the app where tons of knowledgeable members share advice and experience, and support one another in the quest to live a healthy lifestyle every day! If you have an Android device visit the guide for the Android version of the MyPlate Calorie Tracker. Although the two apps are very similar and we do our best to keep them consistent with one another, there are some differences so you want to make sure you are using the correct version of the app guide for your device. Your calorie goal is determined by information entered during the registration/setup process, including current weight, activity level and weight goal. It is very important to accurately complete all of the profile details in order for the Calorie Tracker to automatically determine the calorie goal that best supports your chance to succeed. Many of our members who have been successful in losing weight and keeping it off suggest starting with a less aggressive goal of losing one pound or less per week when you first begin tracking calories. You can edit your weight goal at any time via "Edit Profile" on the "Account" tab. The "Track" tab displays a summary of the day in one place for easy access, including details for your protein, fat and carbs macros, as well as an itemized list of the day's tracking. The handy macro circle chart displays a summary of your protein, fat and carbs intake for the day. Tap the "info" icon to the right of the macro circle to view a detailed Daily Nutrition summary for the day. 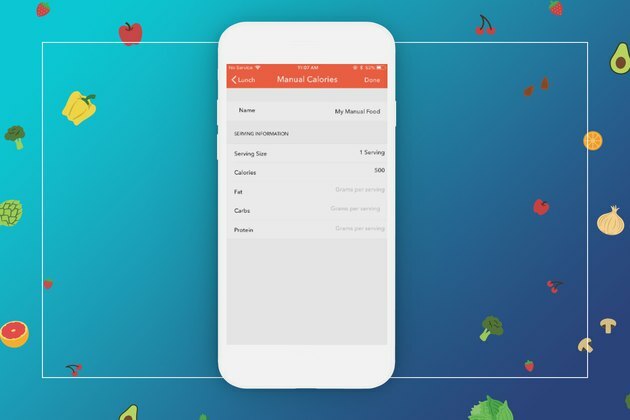 Tap any meal or snack icon to start tracking your food. Use the "What did you eat today?" search box or tap "Scan" to use the barcode scanner to find a new food item. Select any food item from search results or tracking entries to view detailed nutrition facts. Macronutrient details — protein, fat and carbs — are displayed on the main page for each food. Tap the "Nutrition Facts" link to view more in-depth nutritional information. Tap the "Nutrition Facts" page to return to the main information page for that food. After you find the food item you ate, tap "I Ate This" in the upper right to track. Foods you have eaten recently will be listed under the "Recent" tab. Anything you have already tracked for the specific meal or snack for that day will be listed at the top in the "Tracked for Today" section. Tap the "Edit" icon to the right of any food to make changes to an item you already tracked. Tap "My Food" to access your custom items; select any item from the list and then tap "I Ate This" in the upper right to track. If you are creating a new custom item, tap "Enter Calories Manually" to add a new item to this list. Enter a name for your custom item, as well as details for serving size, calories and macronutrients. Tap "Done" to save the item to your "My Food" list for future tracking. 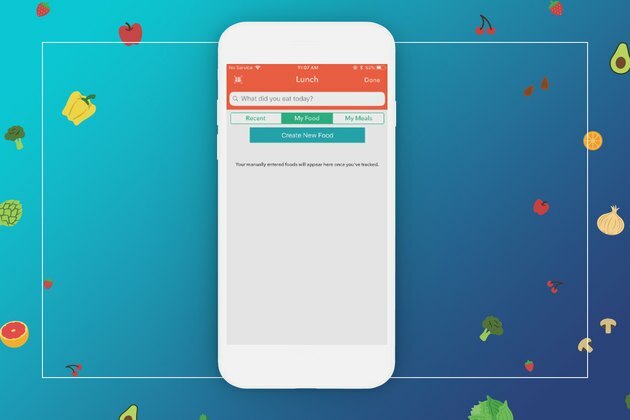 Tap the "My Meals" tab to access the list of your custom-created meals. Tap "Create New Meal" to add a new meal to this list. Enter a name for your meal, and then tap "Add Food" to find individual foods that make up the meal. As you select foods to add to the meal they will be listed on the page. 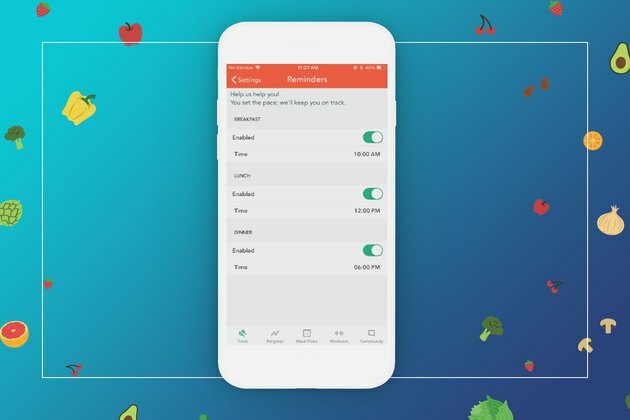 Tap "Done" to save the meal to your "My Meals" list for future tracking. To track a meal, select any item from the "My Meals" list, and then tap "I Ate This" in the upper right to save. Related: Why Isn't My Low-Calorie & High-Exercise Diet Working? 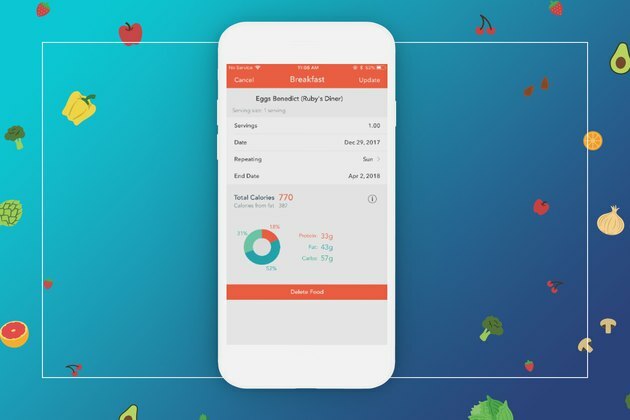 Recurring food tracking allows you to set up automatic tracking for foods you eat repeatedly. If, for example, you eat the same breakfast every day, you can now set that food up to be tracked automatically for up to a year. You can customize it even further and specify only certain days of the week for the automatic tracking. This works great for those who might eat the same lunch every day during the work week but something different on the weekends. Related: Does Eating the Same Meals Help You Lose Weight? Making a change to your daily tracking is easy! Tap the "Track" tab at the bottom of the screen. Scroll down until you reach the item in the list that you wish to edit or delete. Tap the arrow to the right of the entry, which opens the detailed food page where you can make changes. Or, tap the "Delete" button to remove the entry from your food diary completely. Tap "Update" in the upper right to save changes. To make changes to an entry from a previous day, use the calendar to browse to the correct day's tracking details, then follow the above steps. Tap the "Exercise" icon from the main "Track" tab to track your physical activity. Use the search box to find the exercise you want to track. Tap "Enter Calories Burned" to quickly track calories burned when you have a specific number, for instance, if you're using a heart-rate monitor, fitness tracker or information reported from cardio equipment at the gym. 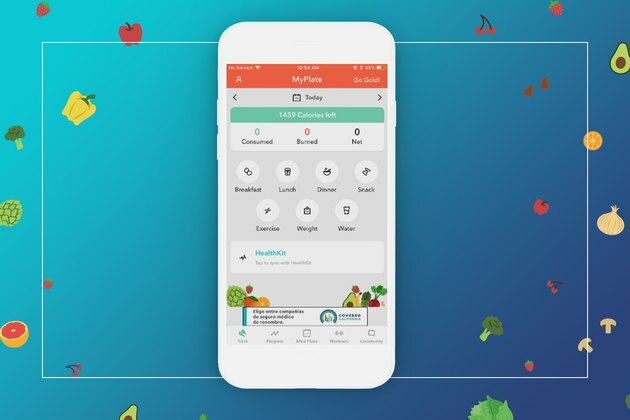 If you integrate with Apple's Health app, your activity will be automatically added to MyPlate without you having to manually input it. Tap "Recently Performed" to access a list of exercises you tracked recently. Tap the "Frequently" tab at the top of that page to access a list of activities you track frequently for quick and easy access. Tap the "Exercise" icon from the main "Track" tab to track your physical activity. Tap "Custom Exercises" to create a custom activity if you are unable to find your activity in our database, or for easier future tracking of a combination or customized workout you perform often. Name your custom exercise and enter the hourly calorie burn rate for the activity — Google can help determine this — to allow for quick and accurate tracking in the future. Need to change or remove an exercise you tracked? No problem! Tap the "Track" tab at the bottom of the screen. Scroll down until you reach the item in the list that you wish to edit or delete. Tap the arrow to the right of the entry, which opens the page where you can make changes. Tap "Update" in the upper right to save your changes, or tap the "Delete" button to remove the entry from your day completely. To make changes to an entry from a previous day, use the calendar to browse to the correct day's tracking details, then follow the above steps to make necessary updates! There are multiple ways to update your weight and keep track of your progress in the LIVESTRONG Calorie Tracker app, but the easiest route is to tap the "Weight" icon on the main "Track" tab. Enter your current weight for today, or select a different date to update a past entry. Tap "Done" in the upper right to save the entry. Keeping track of your daily water consumption is easy in the LIVESTRONG Calorie Tracker app. Tap the "Track" tab at the bottom left of the screen. Tap the "Water" icon from the main tracking page. 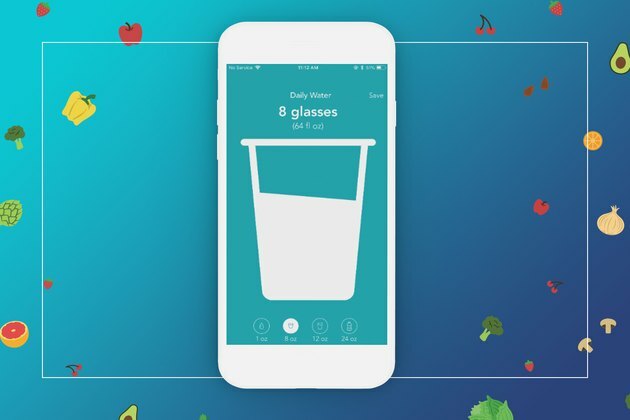 Just swipe up or down on an animated cup to add or remove water. Water can be easily added by increments of 1oz, 8oz, 12oz or 24oz. MyPlate Calorie Tracker makes it easy for you to chart your progress for a variety of time-frames and from many different aspects, including the more traditional weight and BMI, as well as the ability to examine how you are faring with your daily calorie goal and keep track of macronutrient intake for carbohydrates, protein and fat. Also available, the option to chart progress for sodium, sugars and dietary fiber, among others. Tap the "Progress" tab in the bottom navigation menu to access this feature. Tap the arrow at the far right of the "Chart My" bar to select which item you want to view progress for and select any item from the list. After you make your selection you can choose from a variety of timeframe options along the bottom of the page. Depending on the item you are charting you can view a graph of your progress and/or compare your daily numbers with recommended targets or limits. 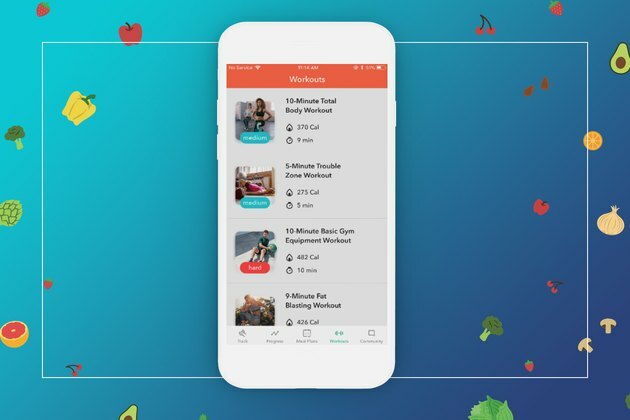 Select the Workouts tab to access free, professionally-created workouts composed of simple exercises that range from moderate to high intensity and are each five to ten minutes in length. Short videos demonstrate correct form for a timed sequence of exercises using only your bodyweight or minimal equipment (like a jump rope and dumbbells). Choose from workouts that focus on specific goals like fat-blasting, total body or cardio sculpting. To access community message boards and connect with other LIVESTRONG.COM members tap the "Community" tab at the bottom of the screen. This brings you to one of our most popular message boards available in the app. We offer 14 FREE message boards that are accessible to all members, as well as one exclusive message board that only our premium Gold members can access. Access the message board menu by tapping the blue icon at the top of the page, tap any topic to enter that message board and join the conversation! Tap any topic in the list of message boards to see a list of community posts on that board. To read the entire message and any comments that have been added, tap any post in the list or reply to the conversation yourself! Tap the pencil icon in the upper right to create a new post or comment; add a photo to your comment by tapping the camera icon. Scroll down the page to access older messages. (A thread "bumps" to the top of the list when a new comment is added.) Tap the blue triangle icon at the top of the page to view the list of message board topics and join a different board at any time. To customize the image others will see when you post on the message boards tap the profile icon in the upper left of the screen on the community tab. Tap the "Edit Photo" link under the profile icon in the upper left. Select any image from the photos stored on your device to use for your profile image. "My Posts" is a list of all the threads you created, which provides an easy way to follow-up to see if anyone has commented on conversations you started. "My Replies" is a list of all of your comments, so you can easily revisit a thread to check back on a conversation. To access the lists tap the profile icon in the upper left on the Community tab. Select the appropriate tab on that page, and tap any post in the list to open that thread. To access your "Favorites" list tap the profile icon in the upper left of the Community tab and select the at the bottom of the screen, then tap "My Profile" at the top of that page. Tap the "Favorites" tab to access your list. Tap any post in the list to open that thread. 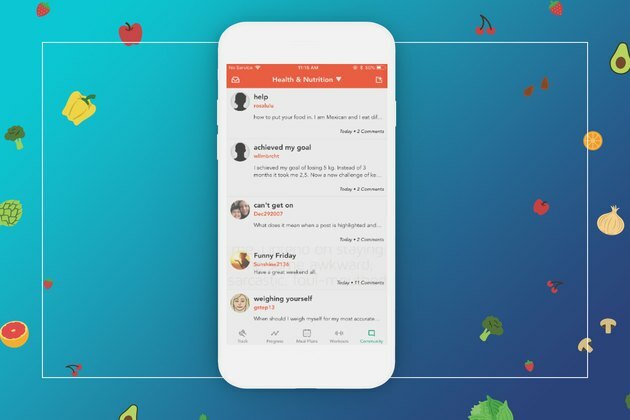 You can receive alert Notifications when the Calorie Tracker app is not open on your device to let you know about new activity on a thread that you participated in or originally started. 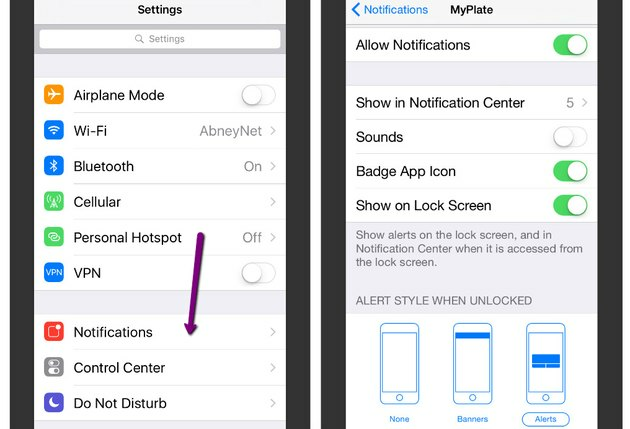 To customize out-of-app notifications or turn them off completely visit the Settings app on your device. Select MyPlate from the list of apps in the Notifications center to edit if or how you receive alerts for new community activity when you aren't using the Calorie Tracker app. The LIVESTRONG.COM Calorie Tracker is designed to provide a comprehensive calorie tracking experience at NO COST to our users. However, we do offer a completely optional premium membership program for those users who are interested in some advanced bells & whistles and other "membership" perks. 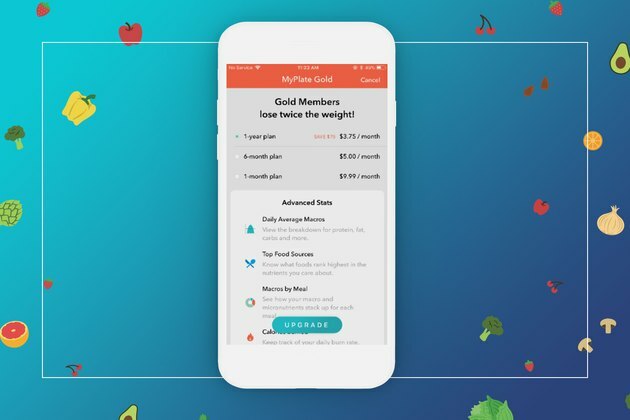 Some of the features of Gold membership include: advanced statistics, enhanced progress reports, exclusive access to the private Gold Members board in the community, our Clean Eating Guide (including 21 recipes and tips for eating clean), exclusive Gold member workouts, an ad-free experience and priority customer support. Follow the link below to learn more! Access your Profile, Settings and an assortment of other useful things by tapping the "Account" tab at the top left corner. Tap "Share" to share your love for the MyPlate Calorie Tracker app with your friends via Facebook, Twitter or email! Tap "Rate this App" to visit the iTunes App Store to review and recommend MyPlate Calorie Tracker to others! Tap the "Account" tab at top left corner of the screen to access your profile. Tap your profile icon to edit gender, height, activity level and weight. Data tracked in the Calorie Tracker app should automatically sync with our servers to keep your account and tracking information up-to-date whether you access the Calorie Tracker via the app or website (as long as you are signed in with your LIVESTRONG.COM account). However, it is possible to "force" the app to sync when necessary. To perform this process manually at any time, tap the Account tab, tap your profile icon, and then tap the "Force Sync" button at the bottom of the screen. It is important to enter your "Activity Level" and "Weight Goal" accurately to enable the LIVESTRONG Calorie Tracker to automatically determine your calorie goal using the Harris Benedict Formula. If, however, you prefer to manually determine your goal, select "Calorie Goal" from the Account tab in the top left corner. 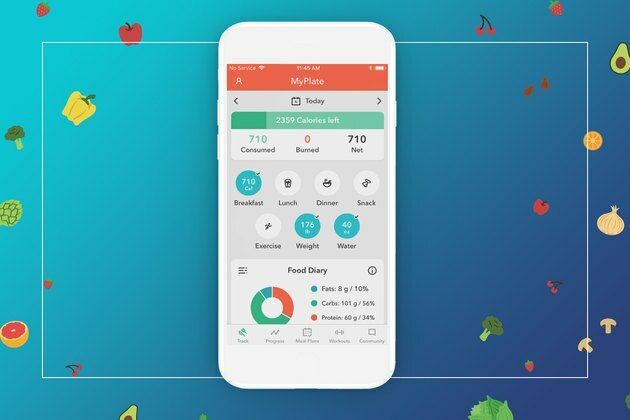 Tap on the profile icon, then toggle the "Automatic" setting to off, and the app will allow you to enter a custom calorie goal between 1,200 to 9,000 calories per day. Set personalized daily macronutrient goals to fit your needs. 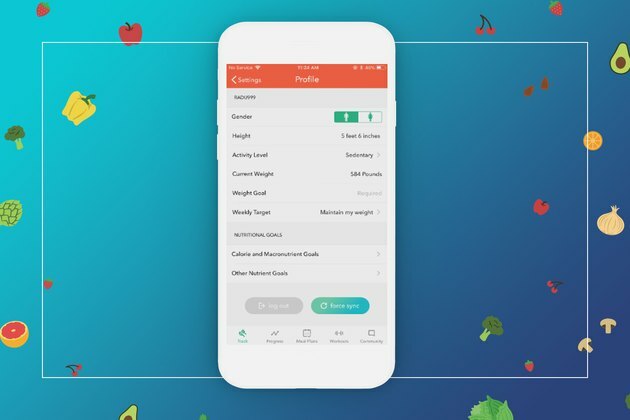 We default your daily macro goals to 40% carbs, 30% protein, and 30% fat, but you can make changes on the Calorie Goal page by tapping the Account tab and then the profile icon. 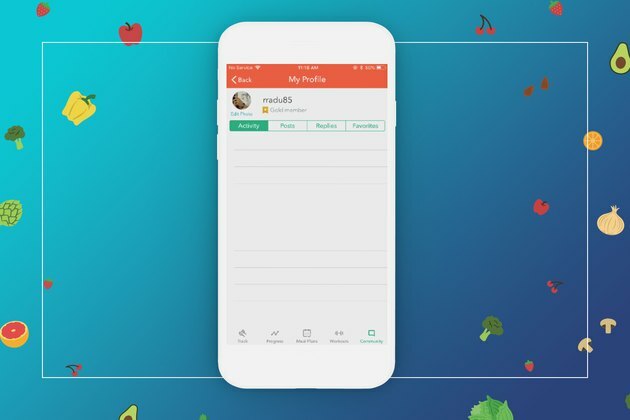 From the "Account" tab, tap "App Preferences" to change whether the app tracks measurements in pounds versus kilograms, feet versus meters, and ounces versus milliliters. Customized "Daily Reminders" are a great way to help keep on track. Access these via the Account tab and the App Preferences tab. Tap "Logout" to sign out of your LIVESTRONG.COM account and erase the data on your device (app data that was previously synced with our servers will be restored when you sign back in to your account). It is strongly recommended that you perform a "Force Sync" before using this option to ensure that all of your data is up-to-date on our servers.